Each day for the next 100 days we will share a picture of our most liked, searched, interesting woven labels made for our customers and their products. Follow us if you are looking for inspiration for your own products, have questions about ours or maybe you are just curious as to what others have done. 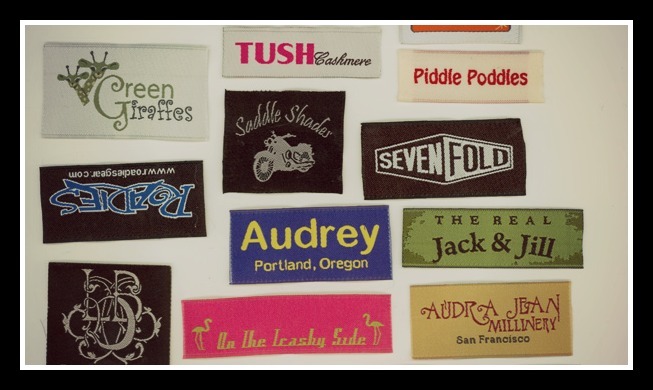 Our most popular type of woven labels, also called “no-fold” labels. They are usually placed on the neck of shirts, inside seam of pants and on the inside or outside of other items. Straight cut labels can be attached by sewing all four sides, or only two of them. Most commonly used for logo labels, there is no size restriction. Center-fold is by far the most common type of fold: it’s placement makes it the preferred one. For many, the easiest way to apply a label is by sewing from the top edge, attaching it to the internal seam of necks, sides, belts; edges of scarves, pillows, blankets,etc. Yet the place where no other but a centerfold label must be used is the hem, sleeve, or pocket of shirts, oneof the latest trends in T-shirt embellishment and a very common one for those who want their T-shirts to stand out from the crowd. Design tip: When talking about small labels that will be on the outside of your product, use the old “less is more”: make an impact and save the lengthy detailed content for larger, hidden labels. End-folds woven labels are mostly used for logo labels in the back of pants, skirts and shirts. The most common reason people choose this type of label for their products is the need to make sure the labels will not bother the wearer at all, they want a smooth feeling so to avoid the dreaded scissors that will have no compassion and remove the tag completely from the item. Yes, people do remove tags from shirts, skirts, and pants, even though we work so hard to make it awesome looking and soft feeling. But sometimes the item is for a baby, or we want to acknowledge those who cannot stand the feeling of the tag against their skin: by folding the edges and sewing it tightly to our product, we are minimizing any “impasse” of our woven labels against anyone’s skin. End-Folds woven labels to the rescue! They will feel softer to the skin, its edges will look more “finished” as the fold will hide any tiny imperfections the heat-cut edges may have. If you are going for a vintage, classy look, you should take a look at mitre-fold labels. But, what is a mitre-fold label? The term refers to labels folded using a 45 degree angle, creating “tabs” used to attach the label to the item with ease. They are commonly used in the back of shirts, coats, jackets and robes; and they serve the double duty of being able to make it easy to hang them item from a well, hanger. Not the most common of labels, yet they add an extra something to the item: elegance, class, retro feeling. Mitre-fold labels are much larger than a straight-cut, ends-folds, center-fold or manhattan-fold label,we must compensate for lost length on the angled fold itself, and the need for a decent length on the tabs, with enough room to sew it to the item. Why on earth would someone want a hybrid label like this one? The reason people love this type of label is they love the professional, clean and polished look it brings to their items: its end-folds are soft and perfect, and its centerfold gives it a nice strong yet soft quality, it gives it “form”. 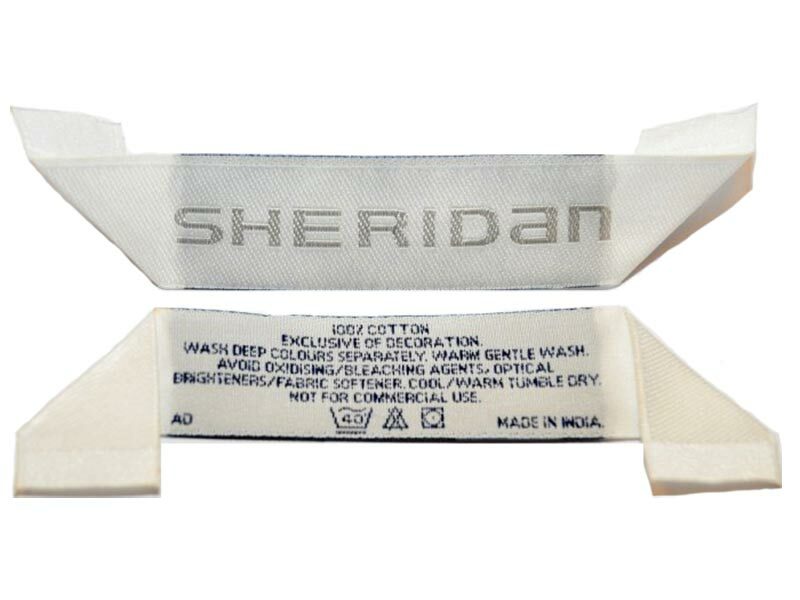 Manhattan-fold labels are used on the outside of items, commonly the bottom, sleeve, pocket or next seam of shirts and t-shirts. Next time you go shopping for a shirt for a male friend, pay attention: a lot of those shirts that get your interest usually have that extra something, and it is usually an extra tag, proudly showcasing the brand or it’s core message. Manhattan fold labels can only be done in orders of 2,000+ woven labels. Make sure you let your sales rep. know how many do you need, as she might be able to suggest a different solution that will work in almost 90% of the cases. This is one of those “Questions that we wish our customers asked us before ordering woven labels“. It is not about hand-holding, it is not about up-selling or side-selling, it is about making the right choice for your products. Our at least not the worst choice. Or a choice made out of not knowing you have other options available to you. We will be talking about folds. Check-out the picture above. We chose a very common label size ordered by our customers, we left the size of the design or “Logo Size” the same, while adjusting the size of the label to fit this size. 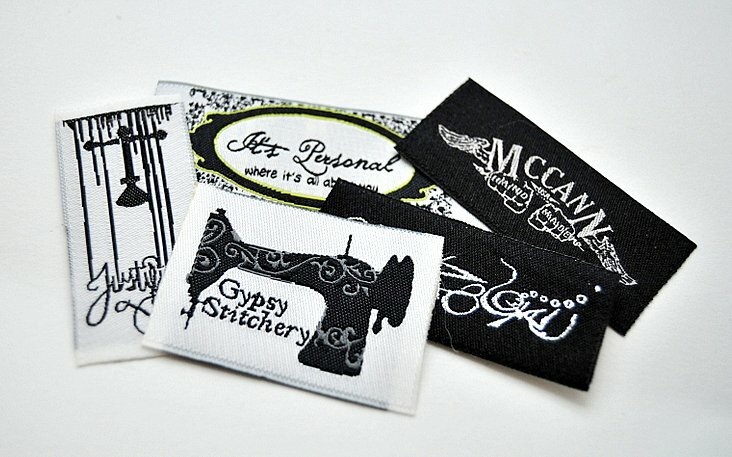 So What Do You Do To Save Money on Your Custom Woven Labels? -Order the No-folds or End-Folds style. Keeping it simple is visually appealing in the world of Woven Labels. Black and white provides a great contrast and is the simplest graphically to read. This is why so many choose to design their labels in black and white. The labels featured on this page were designed for a variety of customers; some with simple designs and a few with very intricate looks. As you can see, the details really POP in black and white. For a little added extra; some add a hint of a highlighted color; further enhancing the look. If you want your brand to stand out against any fabric or pattern, black and white is definitely the way to go. These companiesdark and edgy aesthetic is based on a design mantra to find perfection in imperfection. That statement alone explains the unique design elements they created in their labels. 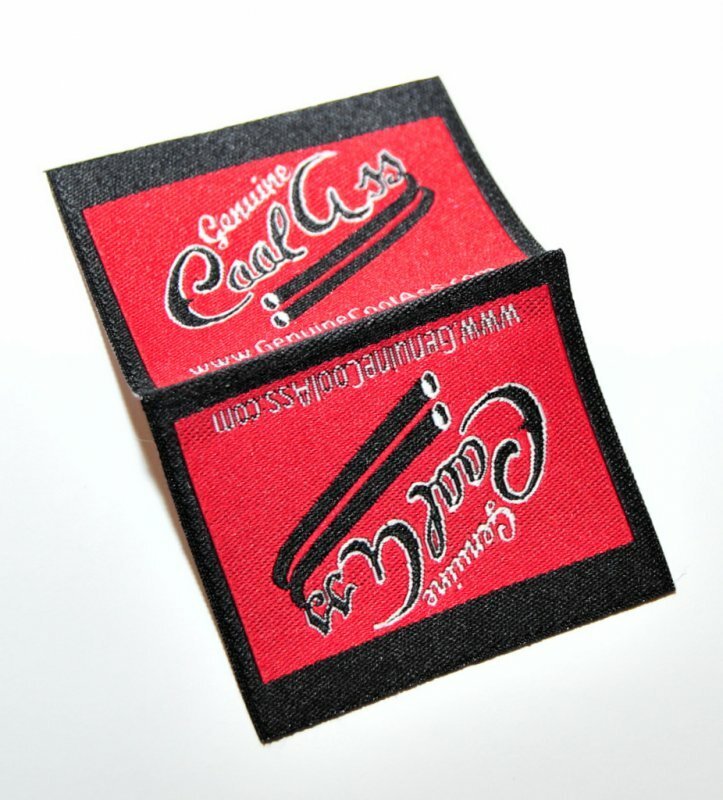 This series of woven labels includes flat labels with a heat-sealed border, end fold labels and a series of hem tags. All of the designs look unified, yet unique in their own right. It’s a great idea to design a series of different labels with a common thread. It can be through font style, colors or type of design. Another great idea to make an impact with your labels is to choose a Vintage Style Font. Looking at this label from a Menswear company just leads you to know that this company stands for elegance, style and reliability. Even if they have been in business only a year, this label says something completely different. It provides the depth of thought that they have been around for 100 years! So many things to consider as you begin designing your labels. 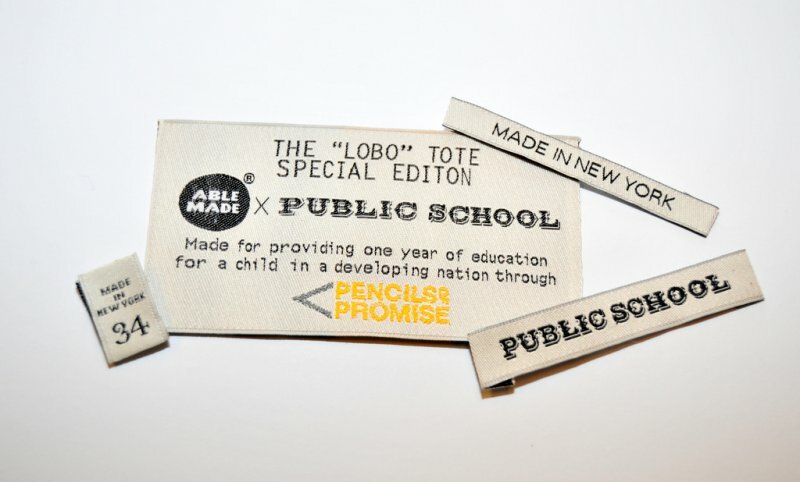 We hope this series of ‘100 days of Woven Labels’ inspires you. Custom Branding your line of t-shirts is a great idea for any company, small to large. One of the number one things to do once you’ve selected your company name, is to brand it with your logo then spread that logo and design throughout your labels, websites, and advertisements. Here is a company that made the decision to allow us to make their woven labels to brand their line of T -Shirts. They have gone on to create jackets, totes, purses, etc. This is a fun new company that has custom branded their line. We are looking forward to watching them grow! 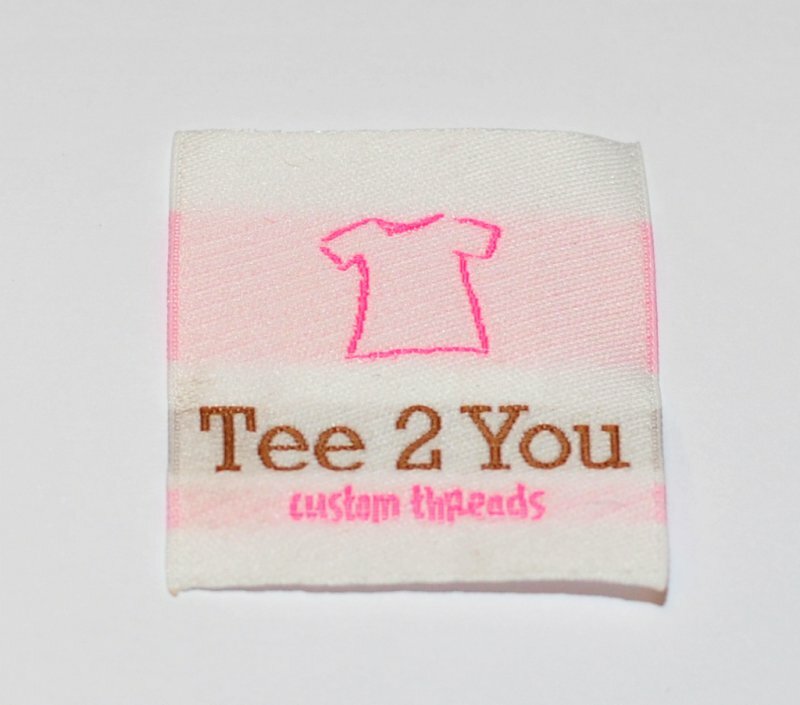 Tee 2 You is a great new company established by a mother with three daughters. As she states, “Fashion is a passion” and she shares this with her three daughters. The entire idea originated when her oldest daughter came home with a boring camp t-shirt. Since then, her home turned into a production facility where great new custom designs were born. They have fancied up the t-shirts, jacket and tote business. She basically takes any of your old, all time favorites and gives them a facelift. When you are ready to Design your Custom Labels and Brand your Product Line. Contact Us at Sienna Pacific! Here is a clothing label we produced for a Nigerian Company named Tamris. 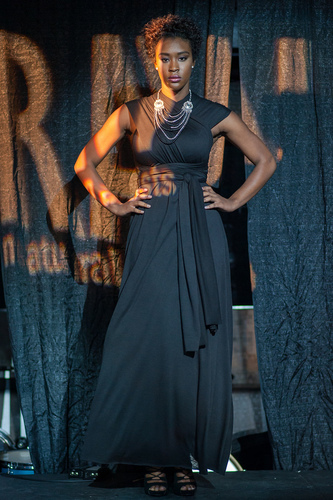 This Global company offers ready to wear and bespoke apparel created by African designers including: AsakeOge, Estella Couture, Brides & Babies and Glamm Fashions. They launched in 2013 and seem to offer a wide variety of African Clothing Apparel. Simple, yet elegant design to brand their custom products. These woven labels went through a few font changes before it landed on this particular font to send the distinct message of style. This is something we do with all of our customers; we are not happy until you are happy! This label is a 2″ wide by .75″ height flat label. The simplicity of one color can have a big impact on readability and design. Click on the following link for more information on The Impact of Black on White or One Color Custom Labels. 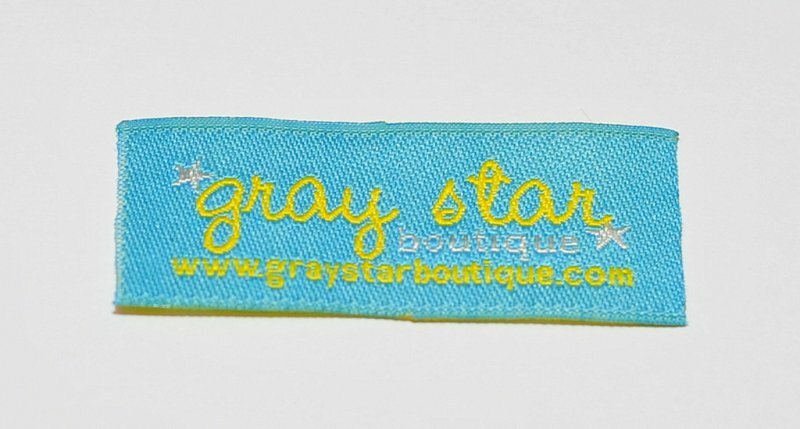 And gray is certainly not a sad color when it is used in those products found at https://www.graystarboutique.com. 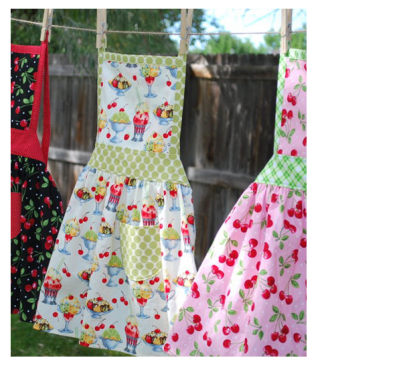 They use fun fabrics and have fun and whimsical designs. Couple that with their desire of serve and fulfill the ever growing market of providing natural options in the baby clothing, diapers and blanket world; what you get is a very environmentally conscious and creatively progressive young company. The main reason we love this woven label is based on how it makes us feel when we look at it: Their choice to use bright colors, keeping them childlike in design, really lends itself well to the message they are trying to portray with their line of clothing. The script font used in the design is “handmade enough” while it is still conveying a professional image. A straight-cut label was the perfect match for this project: most of their items carry their the label on the outside and by sewing it all around they are guaranteed to stay in place without bothering the delicate skin of those tiny and precious wearers. People pay Tribute to a lot of people, places and countries. But to pay TRIBUT to this label, one must LOVE THE MUSIC! This company knows how to Rock & Roll, and it has created a line of t-shirts and designs to prove it. They pay homage to all the greats that have ever picked up an instrument, and all genre’s that have made an impact on the global music scene. This label is shows simplicity at it’s best. A white with black lettering woven damask label. Quality and impact wise, it doesn’t get much better than that. They message a simple logo can make speaks miles for the understatement of successful marketing. They have very successfully branded themselves by sticking with one word, one color, one message. The font gives it away; and sometimes a great font choice is all it takes. For a company like this…Bold impact is an understatement. A company that has been Incorporated since 2005, SOLKA brings 27 years of direct experience in Joint and Multi-Agency Survival, Evasion, Resistance, & Escape (SERE) training, Code of Conduct, and PR education, operations, and technologies. A company that offers this array of talent and expertise certainly needed a strong but impacting branding label. What they needed was a label for their outdoor product line, including bags, pouches, clothing, etc. They were not sure on the size but wanted the “Survival Systems” portion of their logo to remain legible without the overall size of the entire logo be too big. They also needed a sew channel around the outside. Keeping with their logo, the background color of entire rounded corner rectangle would be black. This was all the information we needed to help guide the size of their design to the final product. Small enough, yet full of impact. Give us your parameters and we can meet them! You’ve seen those great labels in the back of robes at hotels, jackets, sweatshirts and blouses? You know the ones; the ones you can take the label and hang that item from anything with a hook from the label? Most likely, you were looking at and appreciating what the industry calls, a Mitre Fold label. The Mitre fold is a dual purpose label; it serves as a branding tag with your logo and message; but it also has a utilitarian use; as a hanger! This style of woven labels is not as common as the other styles. However, there are some items that simply need and call for this fold on their label. Lu’Jeanik is a swimwear line that chose the Mitre Fold Label to enhance her line of clothing and luxury swimwear. Another well designed label taking advantage of the bold look of simplicity. The Mitre Fold label has a 45 degree angle at each end; bending it upward for adhering to the item. When designing your mitre fold label, you need to consider this in the length of your overall design. To learn more about the mitre fold, we have articles published that go into more detail for you. The love from the church to those in need is displayed in this simple, text-only woven label. Nothing exciting, no fancy fonts lines or clip art, yet there is something that moves us when we look at this label: and it is “just” love. Standard colors and font for great impact in messaging. Day 17: Turn Your Woven Label into a Woven Patch! 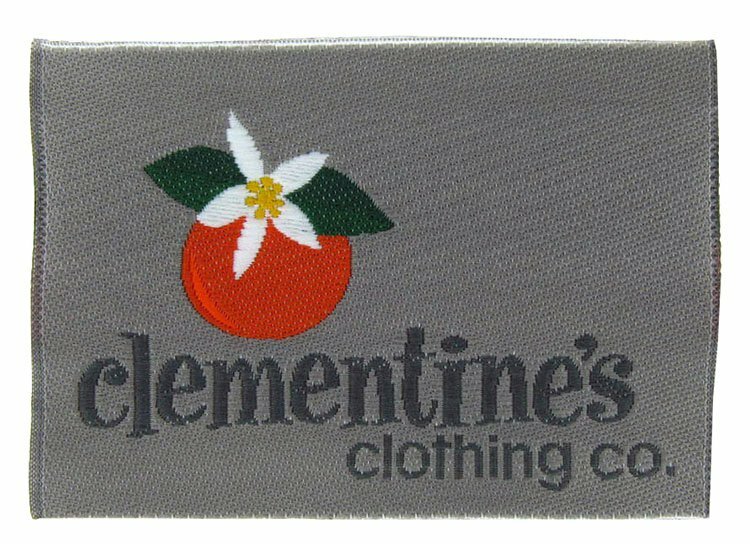 We have been turning a good number of woven labels into woven patches once people have realized their artwork can be utilized in all of our different styles of products. Occasionally you may want a clothing label that is worn on the inside of clothing to become a label to wear and represent on a jacket or outside of your clothing. It just need to be the right fit for your need. How are you going to use this new label you wish to create? How are you would like to attach it to your product? All products (uniform,t-shirt, jacket, hat, sweater, backpack, crochet blanket, scarf, leash, pillow, rug, etc) have different locations and needs for this item so you want to make sure you design and order the correct one. Just a few simple questions such as these can get the project headed in the right direction, and insure you are happy with your end results. Because we do this E V E R Y D A Y. We have seen almost any kind of requests coming through. If you answer these questions, the probabilities of a satisfying experience skyrocket. So what makes a woven patch different from a woven label? This patch was first created as a woven label. The artwork was then adjusted to be used as a patch so their logo can become an insignia to be worn on the outside of garments. So, whatever you may want or if you want to update your woven label and work it into another type of insignia for your company, we are here to help you! Woven Labels are not just for cotton anymore! Everywhere you look, you will find a woven label adhered somehow advertising a company, a logo, a message, or simply care instructions. Companies are recognizing this simple and effective way to promote and brand their business’s. One place our woven labels really shine is for our leather product customers. We can provide a huge variety of color options to enhance the look of your leather products. Jackets, shoes, purses and clutches – our labels have been placed on them all. There are also several backings you can choose to use with our woven labels. Using shoes as an example, we have a client who designs shoes that put a beautiful laser cut, adhesive backed label on the outside of their shoe next to the heel. The result was very nice. So, if your product is canvas, leather, duffle bag (or really anything), don’t hesitate to contact us to see if we can come up with a great design and idea for you to custom brand your products. Here is a company that puts their label front and center on their caps. BadAss Welding Cap Company has several hundred very colorful designs on these cool welding caps have the taffeta woven label sewn right into the rim at the base. This goes to show that you can, no matter what the color combination of your product or what your product is, create a versatile label that enhances your designs. Our woven taffeta labels was the fabric of choice for this company. Take a look at some of our other woven label options by visiting our woven labels page. Give us a call if you are not exactly sure which style would be the right one for you. That is what we are here for! This Skate shop has a full line of skateboards, clothes, jackets, souvenirs and a wide array of miscellaneous items. One thing they have done extremely well is branding. Anyone in the skate world who see’s this bird….knows it’s from Orchards Skate Shop. 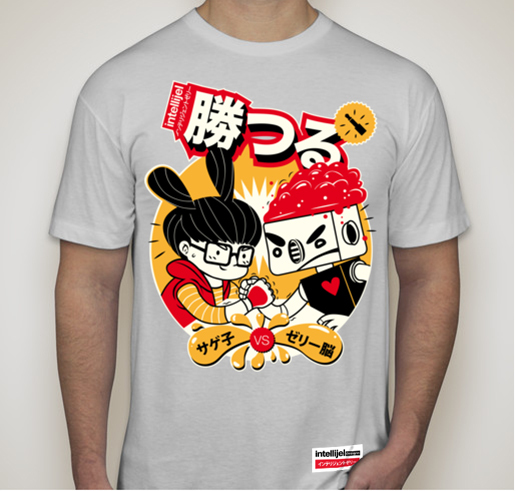 We created this labels for them and their clothing line. There are several color options that they use, all with the same branding. Sometimes the simpler the label, the better. When designing your label, consider your audience and what will be attractive to them. Something catchy and full of possible meanings is simple and fun. Jason Mraz and his rooster; Nike and the ‘Swoop’, you get the idea. So, when designing your label, think simple, fun, catchy and making a point.From there we can help you design a label, or a series of labels to suit your product lines. We love when projects like this come around. This is a really awesome line of Motorcycle Seat Covers, designed and created by Genuine CoolAss Seat Covers. This company did a great job in branding their logo and incorporate it through their line of products. This is a great example of incorporating your branding and using bright colors that really make a statement. Their website is RED, BLACK & WHITE. Their seat covers are Silver and Black.They are utilizing this predominantly red label to tie the website and their garments together in a creative way. This bold Center-Folded Woven Damask Label was created with a Sewing Allowance available at the top. For a design like this (center -folded); that is where the sewing allowance belongs. They chose to put their logo on both sides, the other option would be to change up the backside and put your website address, care instructions or even phone numbers, allowing you more advertising opportunity on the back side of this label. There is no extra charge to change up the artwork however you like. We provide that as a part of our service. Give us a call when you are ready to design your clothing label. We have a lot of experience working with great companies nationally and internationally and we can bring our expertise and ideas to the table to help you make a great impact with your custom labels. Here is a great example of a Music Company that designed a t-shirt advertising their business and they utilized the clothing label directly on the front of their t-shirts. This is becoming a new trend…putting the label on the outside. If you notice their logo is also incorporated into the screenprint itself. What is fantastic about this company is they are actually an Electronic Musical Company that has done an amazing amount of work for the Vancouver Olympics in 2010. You need to check them out. 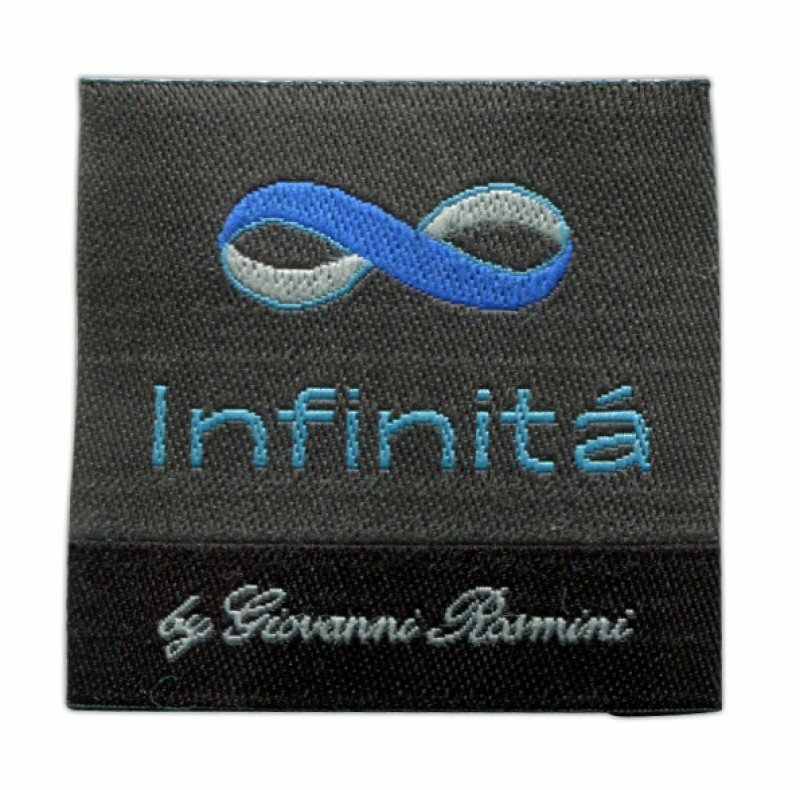 This label is a flat; no-fold woven labels with a sewing allowance on all four sides letting it sit evenly on the shirt. This label could have also been adhesive or iron on back so as to not need to sew it on; but ultimately this is the safest way to insure the label will never move. Day 23: Your Baby Got Their Sugar On? 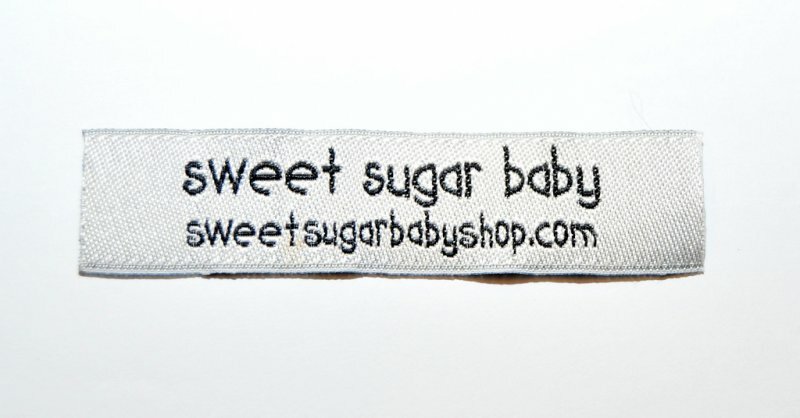 This is a really fun and unique baby clothing company called, Sweet Sugar Baby , that has taken simple text, with a fun and playful font and created unique branding with our center-folded woven damask labels and flat, no-fold woven labels. What is great about this label is they took a standard centerfold label, and did the centerfold the long way giving the label a way to hang the item as well as an advertisement for the client. 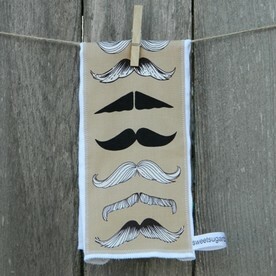 This is an infant towel, a boys gift set and a fun burp cloth. As you can see, the tags are clearly unique from item to item, but it is following a simple design consistency that lets them utilize the same font and concepts on every item. We also do hang tags (the tag hanging on the green towel is called a hang tag). Sienna Pacific makes tags in a series like this to custom brand each of your unique products ‘uniquely’ without straying away from the same branding concept. Make them as long as you want; say as much as you want and make them as many colors as you want. That ‘s the key to CUSTOM Labels, they are for you to create and design! This Woven Damask Care Label is considered large. We wanted to show this one to you so that you can see how readable the text is, even though it is a woven item. Woven labels are more cost effective than printed and there is general pricing for woven labels available to help you in your decision making process. So many think they have to go with ‘standard’ text on their labels. Why, on your unique product, would you keep it standard? Utilize your custom label to do more than just provide instructions. It is a great way to get your branding and point of view out there to your customers. Here is a company that takes quality and design to the next level. Working mainly in Greek Apparel (as in Fraternity & Sorority houses for Universities), they have a line of tuxedo’s, suits and menswear that warranted a nice woven damask label. This is a relatively large label, measuring in at 5: x 5″ square. They chose an adhesive backing for their label so that they could put it on the inside lining of the jackets. We can also produce labels of a similar design to go into the neck, collar vest or waistband of the suit as well. Putting together a series of labels for cohesive and clear branding is a great idea for a suit or tuxedo combos. They have more than one garment and this not only lets the customer know which suit pant goes with which jacket, but let’s you maintain your advertising and branding throughout the set. Here are a few other Menswear labels we have created. As you can see, customizing your label can be anything you would like. From full color and whimsical to simple and elegant, we have done them all! Even though we produce woven labels for companies all of the Nation and Internationally, it is always fun to produce labels for a clothing company located right here in sunny Southern California. When you think California you think Surf, Sun and Sand. 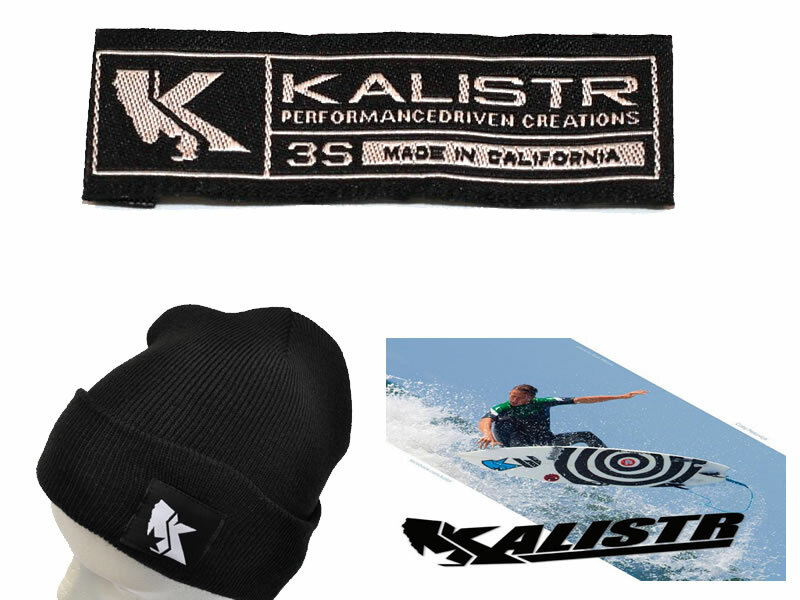 This line of clothing by Kalistr fits right in to that Southern California Style in stride. They not only have a line of awesome clothes, but they also sponsor a surf team. We create their woven labels for many of their products, including one for their hats. 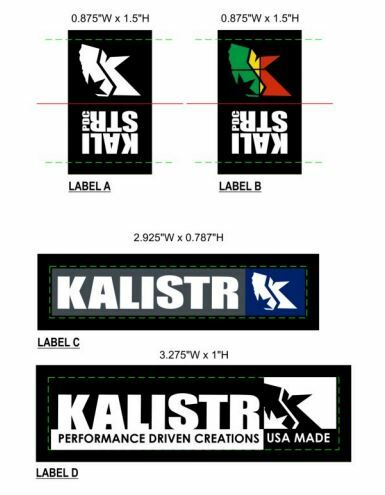 The labels we have created for Kalistr incorporates that state of California insignia with the ‘K’ in Kalistr. They have successfully designed and branded their company to where all you need to see is that logo with the star and the state to know you’re looking at a Kalistr design. Here is an idea to show you how the process is done to establish your colors and design for creating labels for different products. They have a great design team to work with, but you need to know that if that is not something you have at your fingertips, it doesn’t mean you cannot create something unique for your line of products. We have a very experienced team of professionals that work with you from start to finish on creating your labels. Day 27: Is Your Mitre Fold Label this Oodelicious? Here is a fun miter-fold label that was created for a line of clothing for….you guessed it. Poodles! 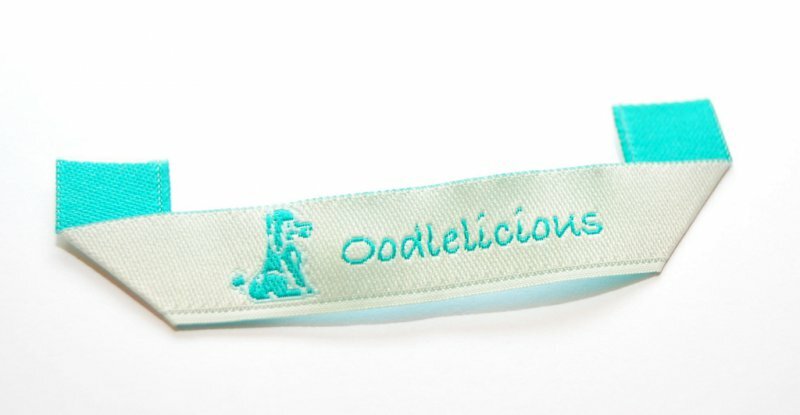 The simplicity of this label was a great choice for Oodelicious and making it able to be used how miter fold labels are used, probably comes in handy for the pooch clothing industry! 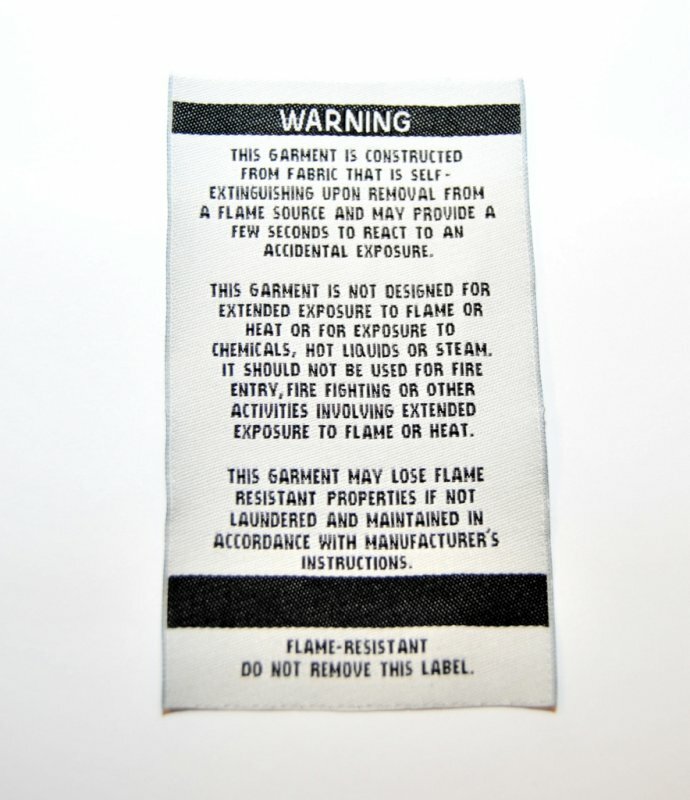 This type of label is designed to use the label as more than just a label, but many people use this particular fold of a label to hang the garment on a hook. If you have ever stayed in a hotel and hung that hotel robe by the tag, it was probably a miter fold woven damask label. If you are interested in learning more about the folds that you can have your labels created with; just check out our Designing your Woven Labels page on this website. Most of our folds come with a minimum order of 100; however the Miter Fold label comes with a minimum order of 2,000 pieces. 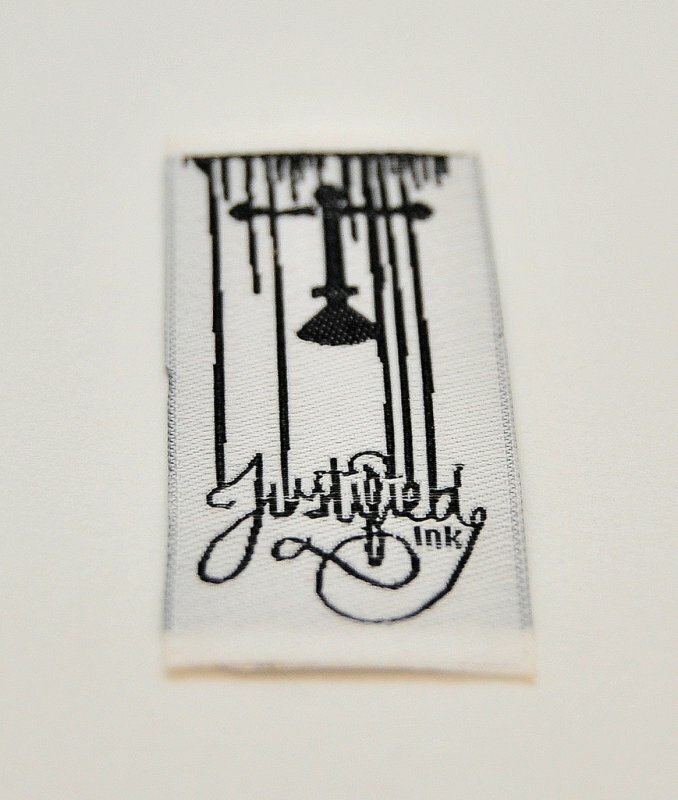 When you have a company as creative and artistically driven as Justified Ink, you need to come up with a creative woven label that represents their artistic point of view. The final product they landed on is a great design that goes to prove that there is artistry and boldness in the simplicity of text. Check out this great video of their latest product line! This is a basic two color (white and black) label that packs a serious punch. They kept their label simple which does not take away from their artwork, their message, or their designs. 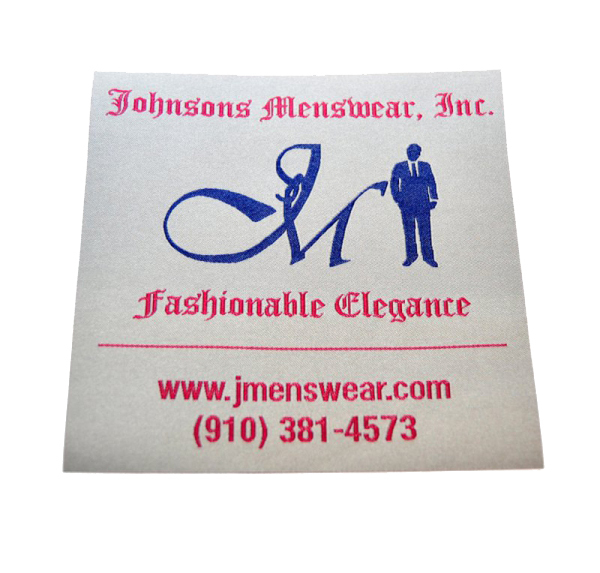 This is a flat; non folded woven damask label. 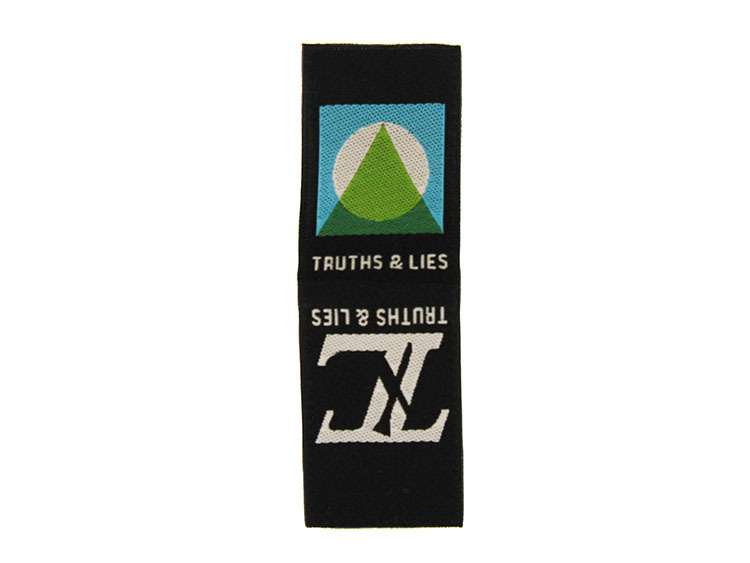 All of our woven labels are heat sealed on all four edges so you don’t have to worry about fraying. This company came up with a great way to utilize one label for all of it’s purposes; keeping the garment free from too many labels. They chose the miter fold label as they wanted it to also serve the purpose of providing a hook; then they chose to have both sides woven with the care instructions on the back. The best way to describe this is to say that first, the height of the original label is actually double what you are seeing. Because it is woven on both sides, it needed to be woven on one side then put together and sealed on all edges. This process had to happen BEFORE the miter fold was added to this label. That’s what makes this label so unique. The finished label, for appearances sake, looks like it is 5″ long by .75″ height. The label is actually 6″ long by 1.5″ height. If this sounds confusing, don’t let it. This is our job to walk you through the dimensions of your label style options and explain how this works. To learn more about our different folds, please visit our woven label design page. This page was put together to help you learn about the different ways to design your label. Everything from the fonts to the folds are there for you to look at. Here is a company with a great story; we are honored to be producing the clothing labels that adorn every item made by these fair trade artisans for Nativa. Each one having a different story to tell. It is evident that they put their heart and soul into their work giving each finished product a little piece of their culture. 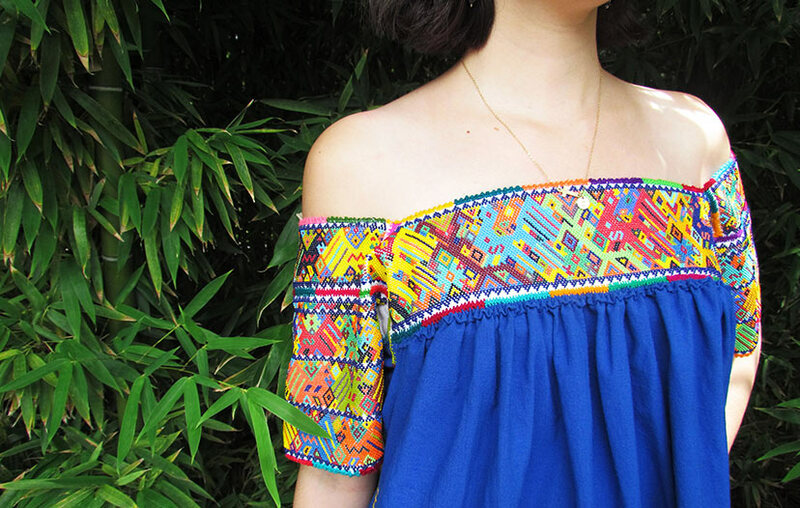 When you buy a hand embroidered Mexican blouse or colorful beaded necklace; be assured in knowing that no two items will be the same. These artisans pass down their skills and traditions from generation to generation. Nativa works with artisans from various regions in Mexico, like Chiapas, Guerrero, Hidalgo, Morelos, Oaxaca, Puebla, Veracruz, Yucatan, and many others. They do this so they can provide their customers with a large variety of styles and designs. This woven damask label has a lot of details to it. Pay close attention to the the green design under their name, Nativa. This shows you how detailed your woven label is able to get. This is a standard damask label (not high definition). The label design lends itself well to their line of clothing. It is bright, colorful and intricate, just as their handcrafted work is. It is also a flat label with no folds. This is a good example of showing you the heat sealed border all the way around the woven label. Full color labels and intricate designs do not cost extra when you order from us. Our pricing is the same on woven labels for up to 8 colors. Our design team is in-house and we also do not charge extra for artwork support. You provide for us your logo and design concepts and we put it together for you for no additional fee’s. This is a fun children’s clothing company that is selling their custom designed items on Etsy.com. It’s always great to see our labels making their way to small and large companies alike. This creative clothing company has a ‘vintage vibe.’ All that is old is new again! Their specialty company allows the customer a unique ability to design clothing and gifts, giving it a truly personal style. This label really captures the feel of their company. Their logo certainly matches their line of clothing. 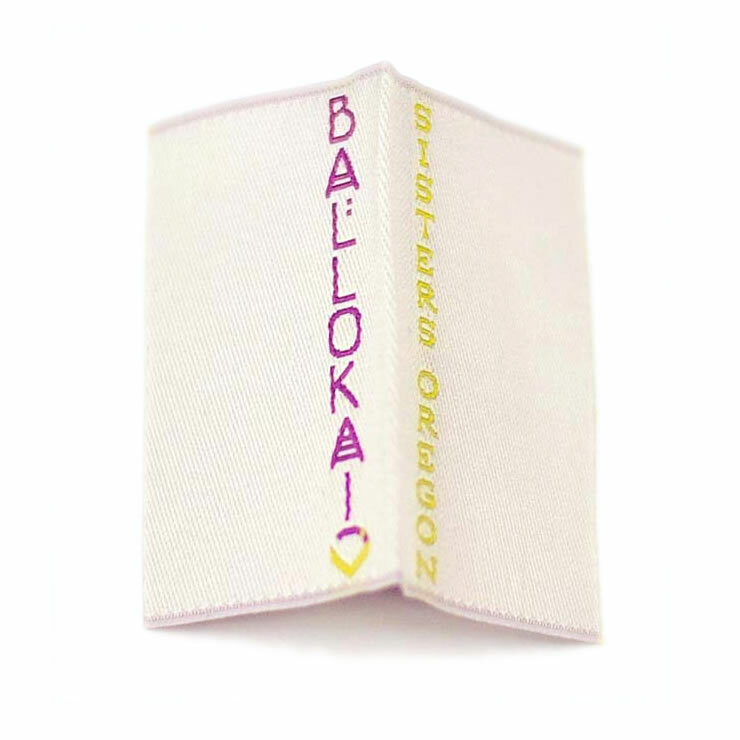 This woven damask label is 2.25″ x 1.5″ with the sewing allowance on the top for them to sew into their clothing. They utilized 5 colors in their design and kept it clean and non-cluttered by using two shades of grey. This really lets the Clementine pop off the label. 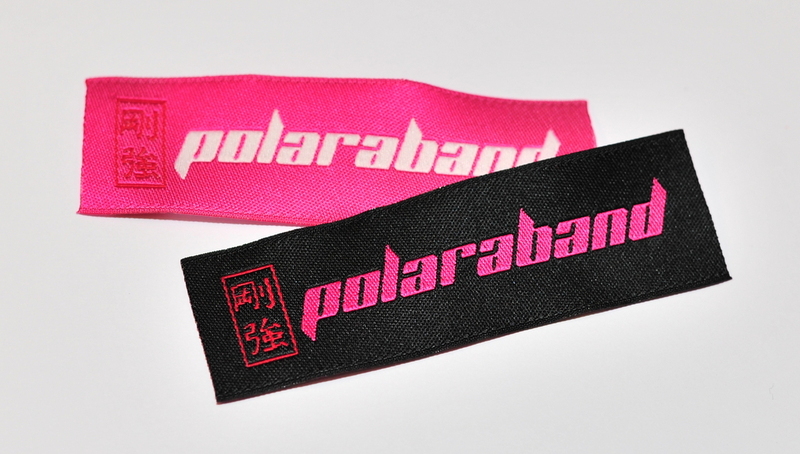 We include up to 8 colors in our woven labels for the same price; giving our customers great flexibility to design away! Who sais scrubs have to be boring, mundane and the usual? This company has a great spin on medical scrubs. Couture it up! 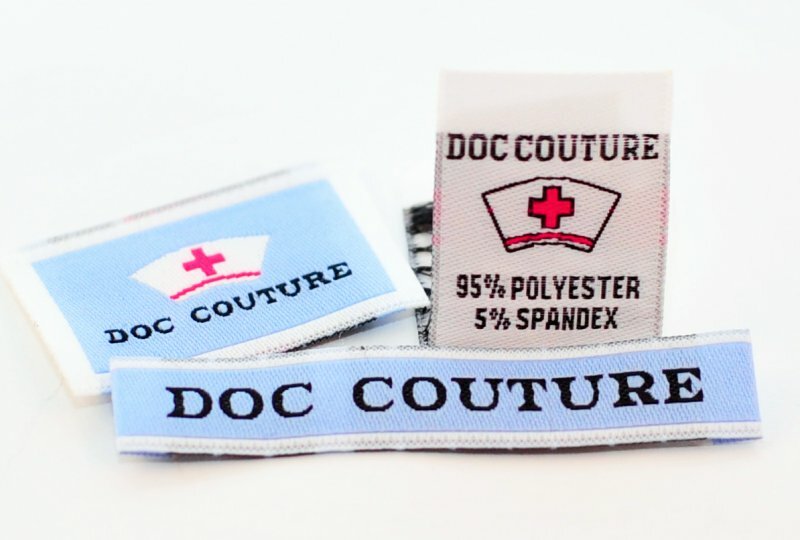 Doc Couture is a unique line of designer scrubs that was created to bring exceptional fashion and a tailored fit to the scrub wearing woman. Creator Jackie Jones recognized the lack of options for women wearing medical apparel. There are scrub lines on the market that have improved the fit and style of the classic scrub but have not yet taken the fit and style ‘all the way’ in the designer realm like Doc Couture has. The best part of this line of labels is the fact they created a series of labels to best enhance their product line piece by piece. Some of their items have the label inside, which would be what the center-folded woven damask label is used for. Others to the outside of the garment (as pictured) allowing the designer scrubs to be branded Couture. All three of these labels are woven damask. One is center-folded with care instructions on the back and logo on the front; one is a neck lapel style with a single line of text and the other is predominantly their logo, for the purpose of branding the clothing on the outside of the garment. Woven label pricing is dependent upon the size of the label and quantity. Whether you put a center-fold, end fold, or no fold. The price will be the same depending on the size. If you have thought one label style just won’t do it; take a note from Doc Couture and consider a series of labels. In a month with all of us are honoring those that have been diagnosed, fighting or have survived breast cancer; it seemed like a great time to ‘THINK PINK’ and share with you one of the labels we created for a company that’s main focus is the health and well-being of all of us. Polaraband is a natural technology that delivers centuries old science that creates a total balance in your body’s polarity. It is known as one of the strongest polarity bands on the market. Some don’t know that foreign frequencies are transmitted throughout the airwaves by electronic devices like our TV’s, laptops, cell phones, etc. This company aims to provide the education and knowledge to equip us all to better health. This is a woven damask label with end folds. In order to have end folds on your label you need to add another 1/2 inch to your design (1/4″ per side). Their artwork is truly striking due to the brightness of the color choices. We all know that PINK is becoming more and more popular with every passing year, and it is especially popular in October for Breast Cancer Awareness. This label points out how dramatic the color can look on a clean design such as this. 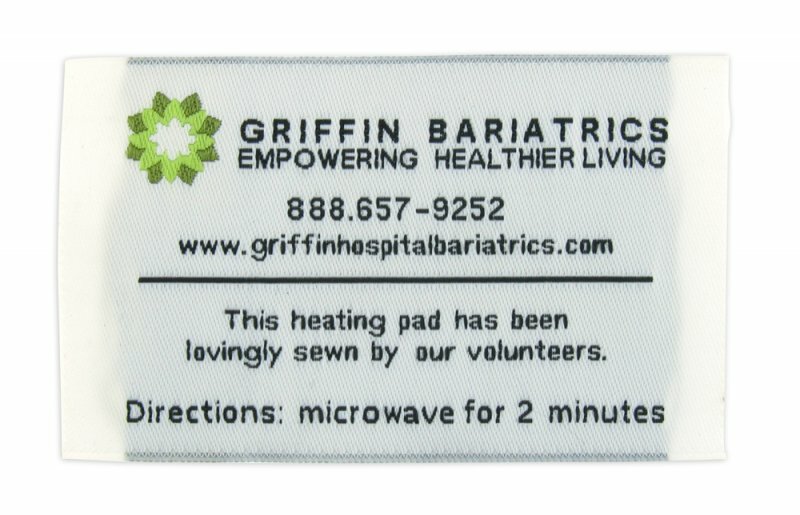 Here is a label we produced for a medical group wanting to provide comfort after surgery with heating pads. The volunteers at the medical center create these pads and needed a care label so their patients would know how to take advantage of their gift. This woven damask label is flat with no folds; but as you can see they put a 1/4″ Sewing Allowance on both sides so they can affix them to the heating pads. Woven Damask is a very durable style of label and works well for this type of product that will be washed, dried and even microwaved. Not all labels withstand this type of usage so it is good to let us know, should you have an unusual need for your label, so that we can help you select the best type of woven label for your project. This is a designer driven, high quality, mens fashion line. Being an internet based company, we are able to work with clients from all over the world and this one happens to be in Germany. Their line of mens clothing is very stylish as is their logo. They chose to replicate their logo into their woven labels to keep cohesive branding. This is a woven damask label that has a center fold; off-centered with his name attached to the bottom of the label in a nice script font. Script fonts give the impression of elegance and this nice, clean logo make this a well-designed, masculine clothing label. This Custom Woven Label is a flat, with no folds label. 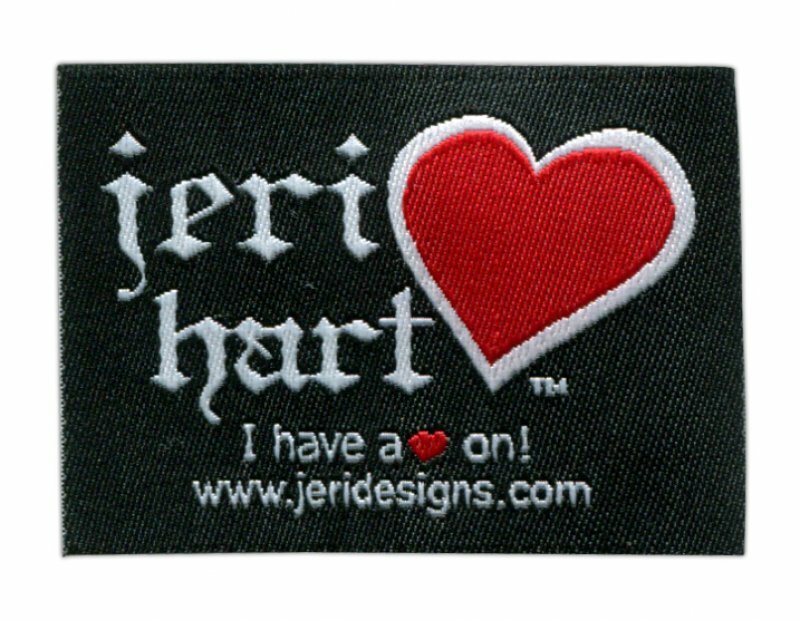 This 1 1/2″ x by 2″ label is simple in design featuring three of the best colors to get your label to POP, emphasizing the Heart in the ‘Hart On’ design. 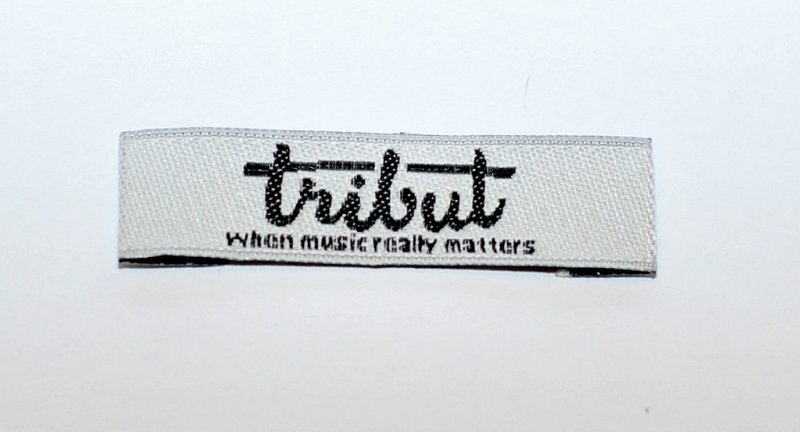 They were successfully branded with this logo on their websites and followed it through to feature the same art on their label for their straps. For items like guitar straps, tote bags, shoes and accessories; we offer adhesiveand iron-on backing as well. Day 37: Keep Your Fur On! There are very few furriers left in the United States. 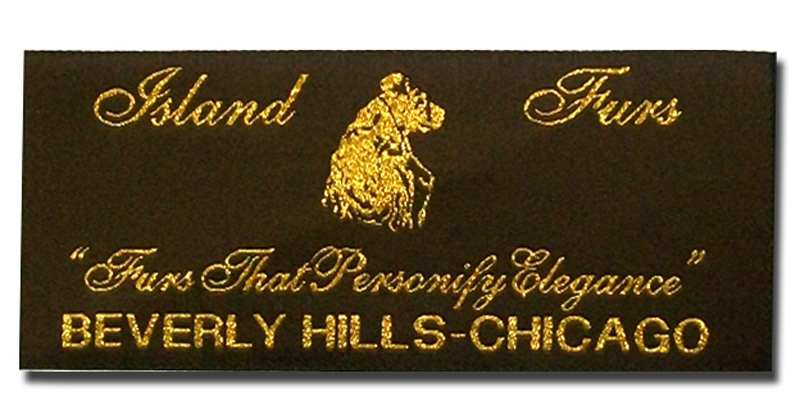 This Chicago based furrier is called Island Furs and for them we created a Woven Damask Label in both black w/Silver Metallic Thread and the example shown here of a deep brown with a Gold Metallic Thread. This is a very elegant label done in two colors; the background and foreground colors really emphasize the nature of the furs and provide an elegance with the metallic threads. 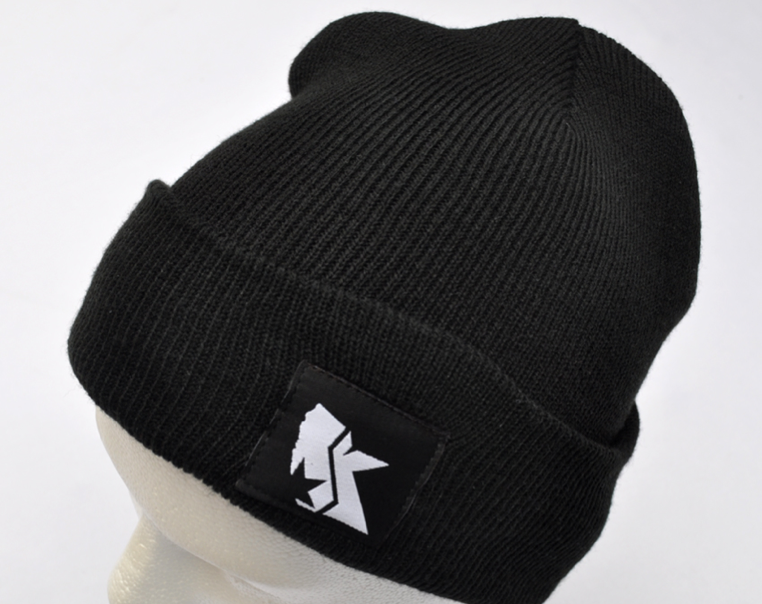 Their design is fairly intricate, which is allowing us to showcase the detail you can achieve with a woven label. Many think the metallic threads will be itchy or not smooth to the touch. This is quite the contrary. If you have considered working with metallic but are not sure of it’s texture, please don’t hesitate to call us and request a sample so that you can see for yourself the quality and feel of this type of woven label. 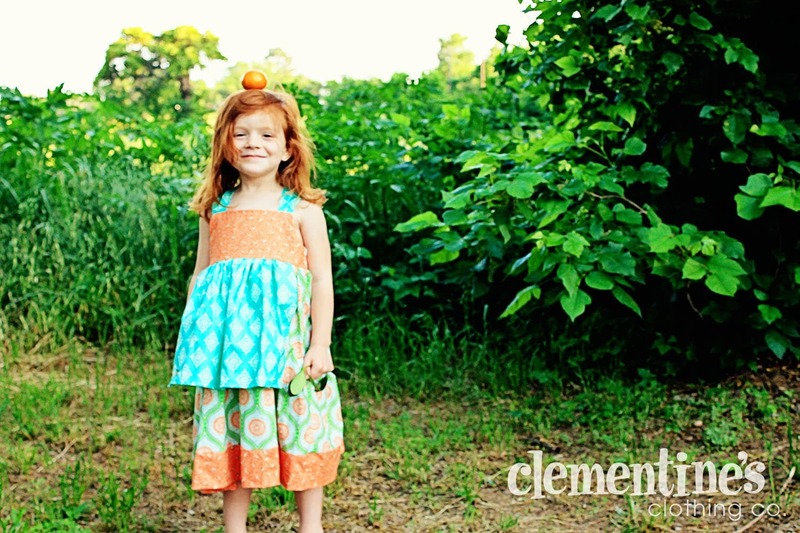 Mila (Mee-La) is a very cool, very hip and very FUNKYline of children’s clothing offered by Mila Designs. This great company has an international flare and did a great job in color selecting it’s labels for a unique custom look. 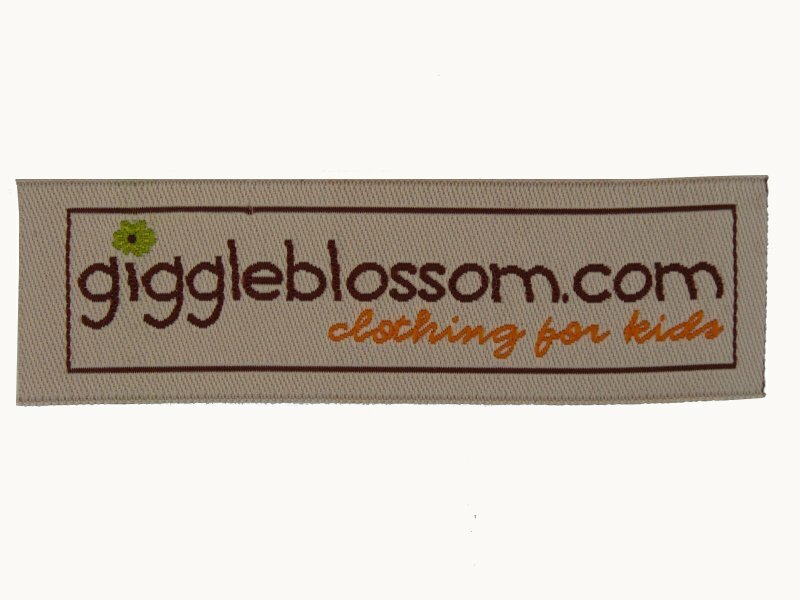 When you look at this label, there is no question it is for baby/children’s clothing. 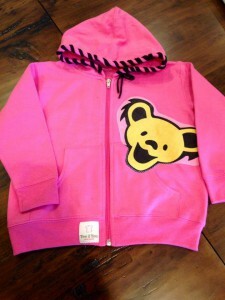 The color composition is excellent as it is non-biased for boys or girls clothing. The woven damask label is flat and sewn on all four sides. So many who create custom baby clothing think the woven damask label is just not soft enough. We are here to tell you that it is probably one of your best options for baby/children’s clothing. If you are designing a line of baby clothes and would like to see samples so that you can touch and feel them for yourselves; please don’t hesitate to contact us and request samples. Our design team is also here to help you develop a label that will work for you and your design concept. 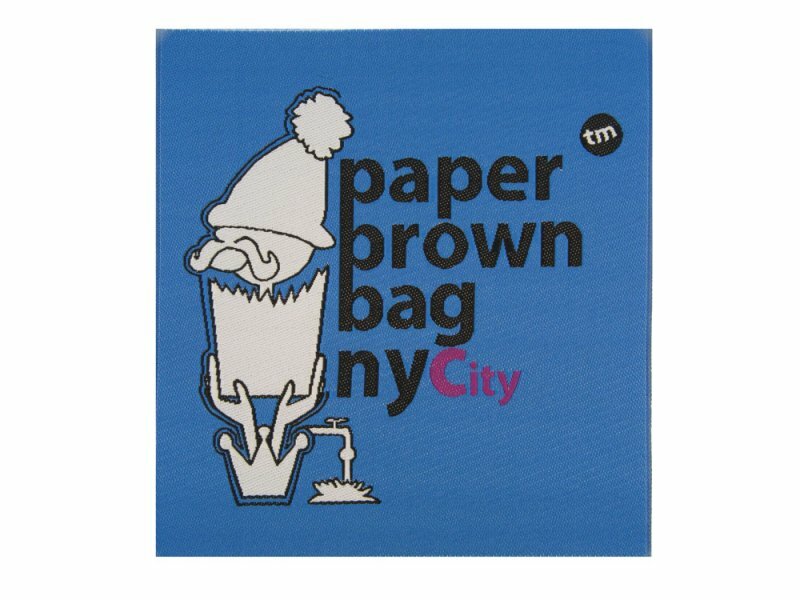 If you are big on custom designed garments then you have probably heard of Mr. Quasim Johnston, Founder of Paper Brown Bag Clothing NYC. His designs produced by Paper Brown Bag Clothing NYC are awesome and we are thrilled to be the supplier of his custom woven labels. Seen on celebrities and musicians all over the United States and worldwide; this clothing brand is making a splash on the fashion industry with his custom handmade patchwork. If you vis it their website, you will see one of our labels walking the Emmy Carpetand being flashed for the cameras in the form of a custom made suit designed by Quasim Johnston. This custom label is as fun and trendy as the line of clothing itself. This is another example of a woven damask flat label that shows a lot of intrigue with it’s design. The colors and artistic elements help in branding this line of clothing. Children’s clothing just keeps getting cuter and cuter! That is certainly true when you take a look at the custom line of clothing from Giggleblossom.com. There is something extra special about homemade clothing that takes us back to simpler times. In today’s fast paced and crazy lives; it’s just refreshing to find a line of clothes out there that caters to the more natural look of custom clothes. This company caters to boys clothes, girls clothes, infants and young children. From Shoes to caps and sweaters to aprons. They carry it all. With that said, they need a very universal label. This woven damask label is extremely versatile and its look is simple and refined. The natural color choices also lend themselves well toward versatility. 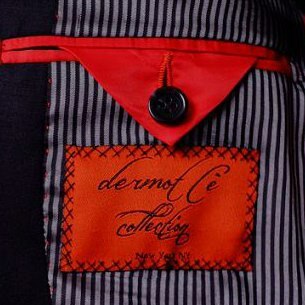 Contrary to the belief of some; The woven damask label is a perfect composition for young children’s clothing. It is soft to the touch and with the opportunity to design a label with up to 8 colors for no additional charge; it is also very cost effective. 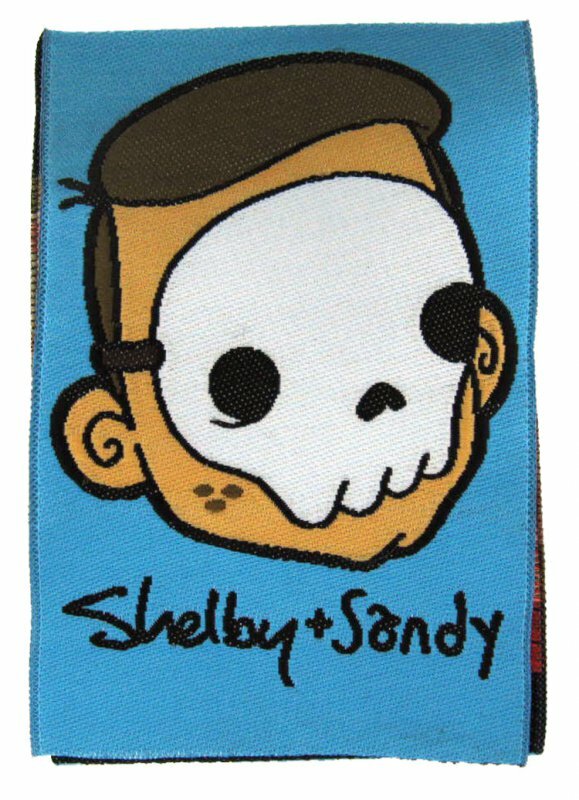 Shelby and Sandy are a brother art collective from Los Angeles. The duo pride themselves on creating visceral nostalgia. And bring an edge back to the art collective world. If this intrigues you; you should take a look at their website and instagram! They are on the cutting edge of nostalgia art and we are thrilled to have created their label used in a variety of their items. Their center-folded, woven damask label is a direct representation of their website and logo for their art collective. Bright colors and fun design and simple statement. We chose to feature this label because it shows you the ability to work with hand-written scripts or your own signature. Some people think they need to decide between specific fonts in order to have written words on their labels, and this is just not true. 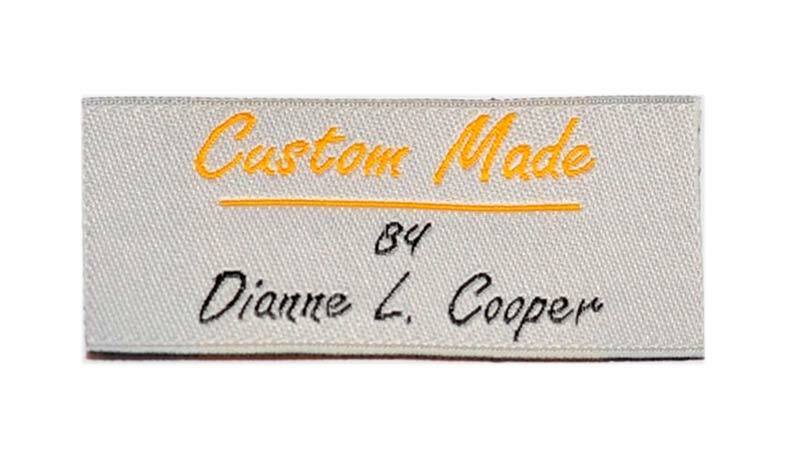 Any design or handwriting can be traced and replicated in a woven label. Woven labels are not just for peoples clothing! We have made several woven labels to go into the ever-broadening world of pet clothing. 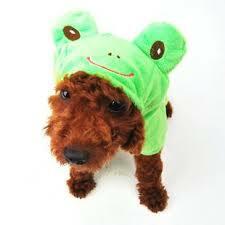 From poncho’s to sweater vests; our labels adorn the cutest of our furry animals special clothing. 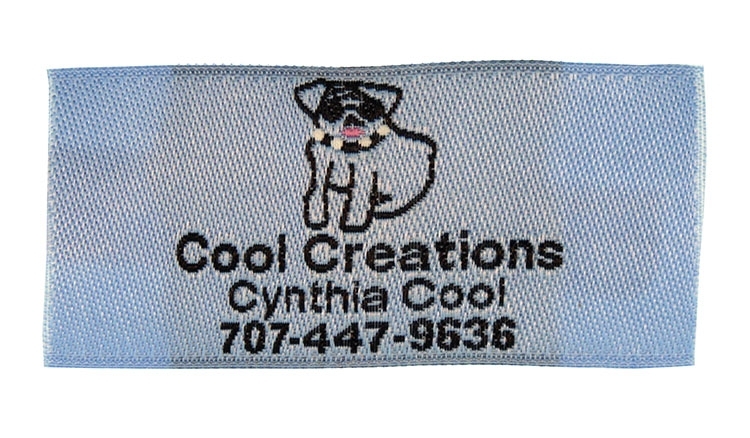 This woven damask label was designed for Cool Creations, which is a fun line of furry animal clothing. This label sports just the right amount of information for people to know where to go to find their line of pet clothing. If you are into crafting and creating for your little love muffins just realize you have companies like us out there to help you design the perfect label to show off your style. 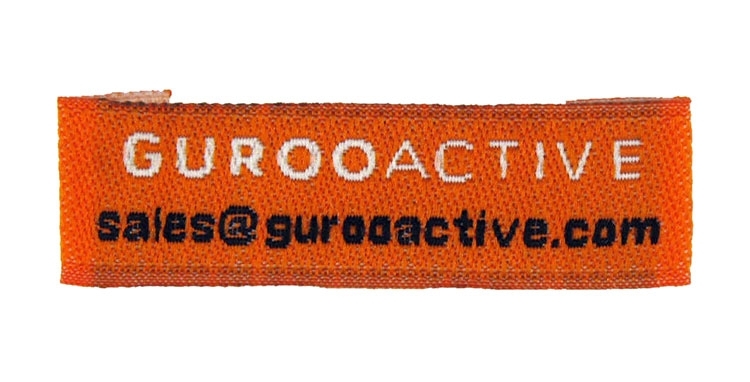 Here is a woven label designed for a line of athletic wear for Guroo Activewear. They specialize in all types and styles of active sportwear for the performance athlete and clothing lines for those searching for yoga wear. Their purpose-driven apparel is for the active lifestyle. Better clothing and accessories through innovative product design, progressive materials, and dynamic sizing options. We wanted to feature this woven damask label so you can see that companies in need of soft and pliable labels oftentimes end up with the woven damask. The misconception that they are scratchy or abrasive is simply not true. If you have a line of active wear or other soft and sensitive material you need to create a label for; don’t hesitate to contact us. We can send you samples for your review so that you can choose the right type of label for your line of products. Here is a label designed for an extremely unique niche in our world. 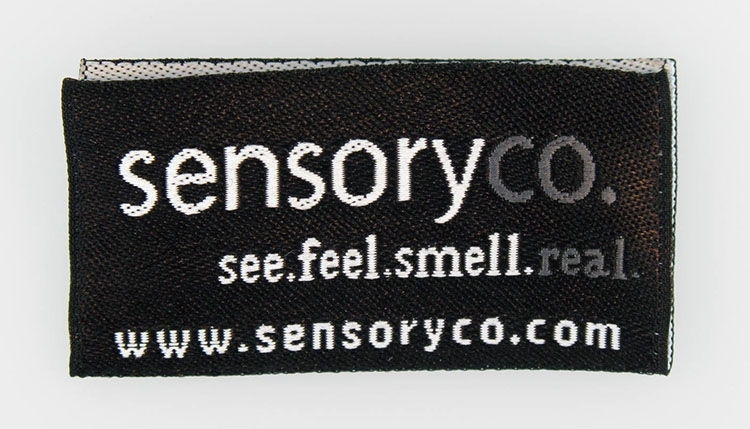 SensoryCo. are the leaders in atmospheric special effects. They basically provide the sensory elements for simulation and training environments including smells, smoke effects, weather effects such as mist, rain, haze, heat, and wind as well as a patent-pending spray motion water spritzer. These specialists need uniforms and clothing too, and it is an honor to be the supplier of their business’ line of clothing. Simple and straightforward; this Black with White lettering label simply states their purpose and their name. This is all they needed and it leaves enough to the imagination that you have to visit the website to understand what they do. Here is a high end suit company out of New York City that produced a very nice woven damask labelfor the lining of their suits. Shown in a beautiful script style font, this custom label becomes part of the design within the jacket. This is a great example of showing once can utilize whatever style of typeface they prefer. This is considered a flat; no fold label with a 1/8″ Sewing Allowance on all four sides. The stitching is especially nice for the design and provides an element of individualized stitching. There are all types of products out in the market for all different area’s of business. There is one thing they all seem to have in common; the need to label their product. This unique product services a very specific industry; hospitals and medical buildings. They are on the front lines of combating infectious diseases and protecting the healthcare workers caring for sick patients. We are pleased to have worked with IsoDoorCaddy by producing their labels. 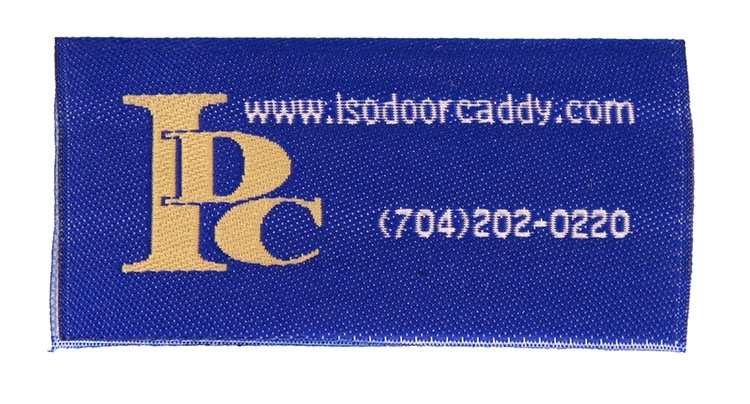 This simple and straightforward label was created for the company IsoDoorCaddy.They needed a label to sew directly on the front of their product for ease of reordering and information. This label shows the versatility of a woven damask label. 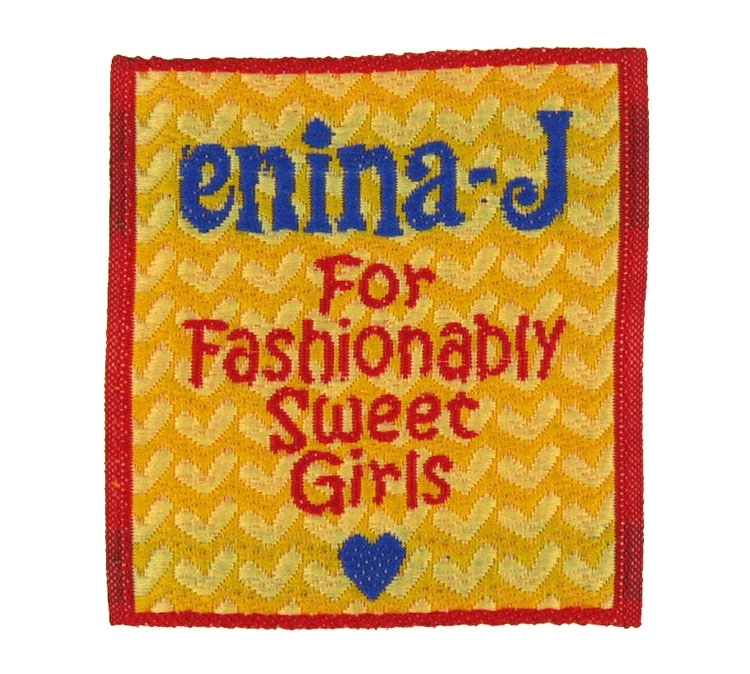 EninaJ is a fun line of clothing produced by Janine Kroes, who calls herself the ‘BFF’ of fashion (meaning: bold, flirty and fab). Her unique designs are beautifully designed and wearing our labels! Janine was born in Uruguay and lived in Switzerland and Panama before finally arriving in Israel. Janine’s life is a blend of different cultures that encompasses many worlds. Spending her life in various countries and learning many languages developed her into a highly curious human being always searching for a connection with the people that surround her. Artist and designer of exquisite jewelry and fashionable accessories, she’s broadened into clothing as well. After many years of experience as a Graphic and Interior Designer she fulfilled her lifelong dream of creating and founding her own brand, Eninaj Design, which is actually her first name ‘Janine’ written backwards. This is one of a few different design labels we have created for her company. She chooses eclectic colors and combinations to work with her line of clothing as well as handbags and accessories. this is a flat woven damask label as are most of her other labels. Things to keep in mind when producing your label is to know that we can produce the same design in a variety of colors; as well, we can put the design on your hang tags for pricing and sizing that will further promote your branding. Ollie and Me is a company specializing in nursery decor as well as offer a full range of items suitable for babies and pregnant mommies. 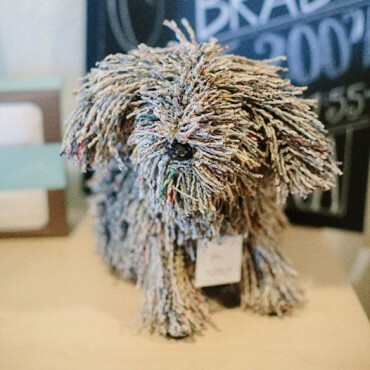 If you’re looking for something unique and personal, they carry a full range of unique gift items sure to make you the hit of the party. With a location in Carlsbad, CA and venturing out through Etsy, Instagram and Facebook. Ollie and Me is making social media a successful tool in showcasing their point of view and style. 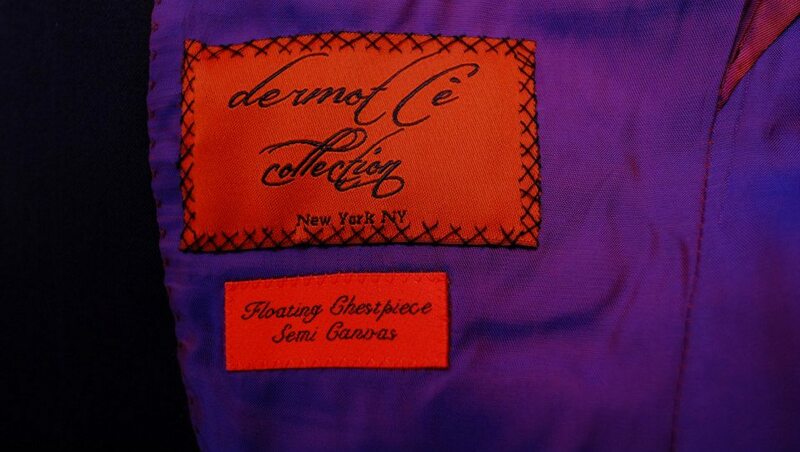 Another example of how woven labels are not just for clothing. 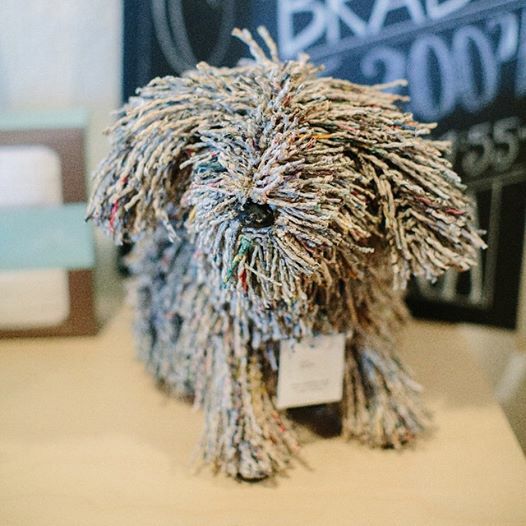 Here is a puppy toy made out of 100% recycled paper. This family friendly shop definitely has the edge on being environmentally friendly. 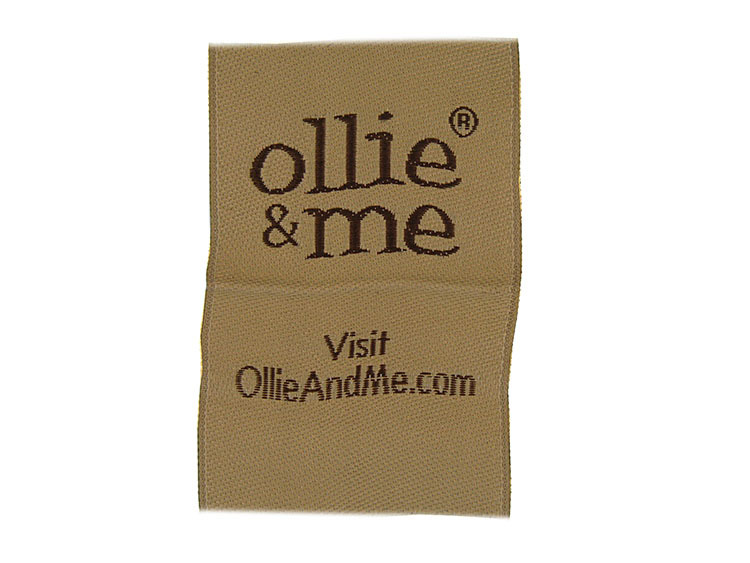 The Ollie and Me label is a center-folded, natural colored label that is so universal in its choice of colors. One thing liked about their label is that it put a very simple ‘call to action’, leaving no doubt at all where to go to find their merchandise and website. A lifestyle brand for on and off the golf course. This company is a breath of fresh air in the golf industry. 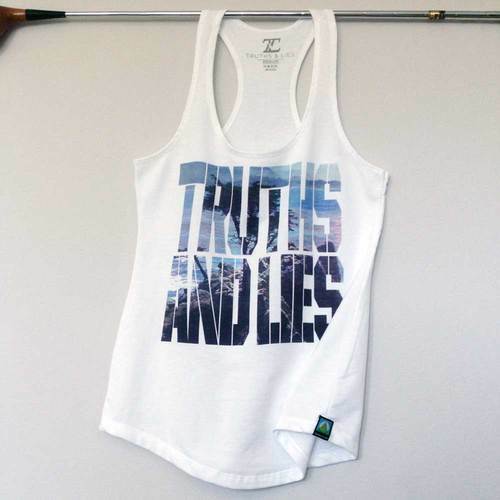 Truths & Lies is doing a phenomenal job at pushing pop culture onto the fairways and greens with trendy fits and tongue-in-cheek graphics. It doesn’t matter where you are at; the green or the gun range; Truths & Lies line of clothing is speaking to all of them at every level. 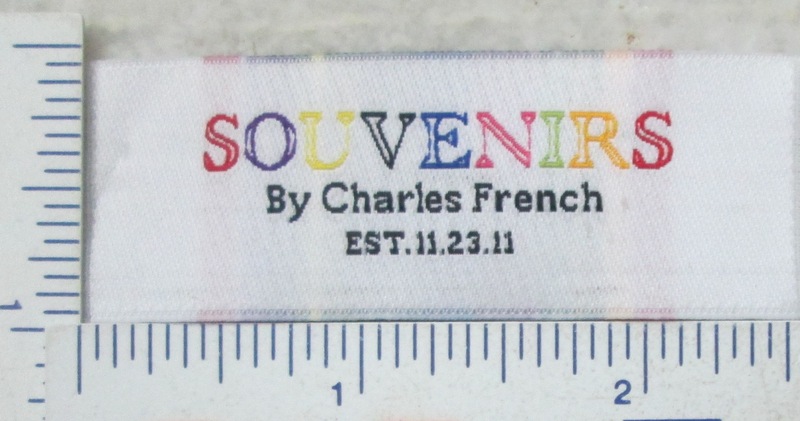 This is a center-folded, woven damask label that has the sewing allowance on the top/bottom so that it can be used in the back of t-shirts, rim of hats or as a hem tag on the outside of the t-shirt as shown above. The versatility of the tag is evident as it can have either side showing as the dominant feature of the label. 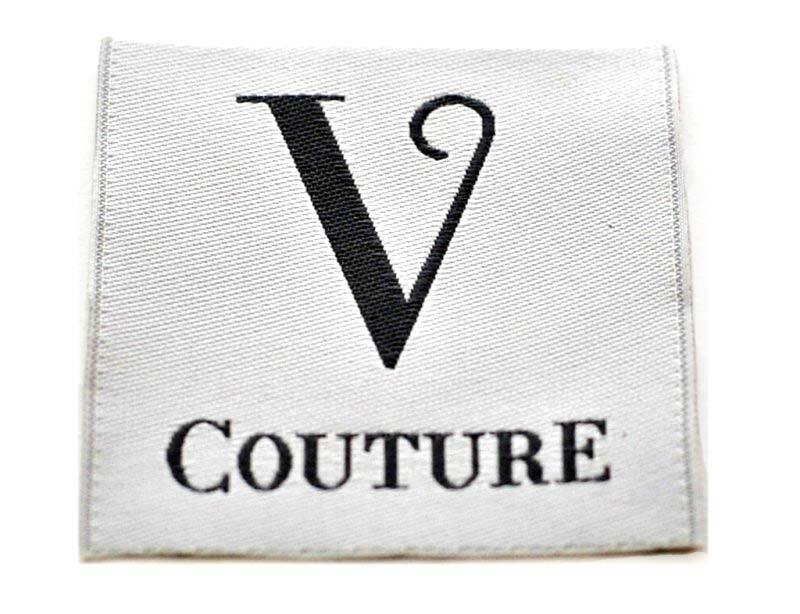 V-Couture is one of the most talented designers in the Designer Corset marketplace. Each piece is so very unique and individualized that you must visit their website to fully appreciate the spectrum of his offerings. 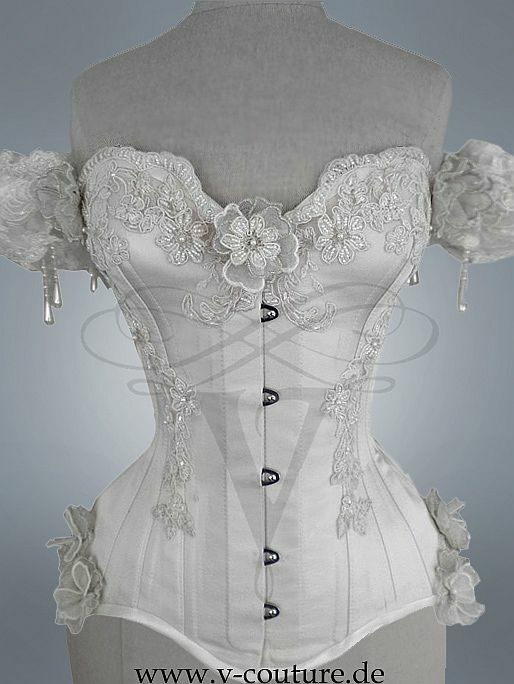 The design of this label is so elegant and perfectly stylized for this unique line of corsets. Again, showing the diversity of the damask woven label. They adorn everything from the highest of quality designs to the children’s tote bag. With every option at ones fingertips, you can truly create a unique label by working with the colors, design and size. 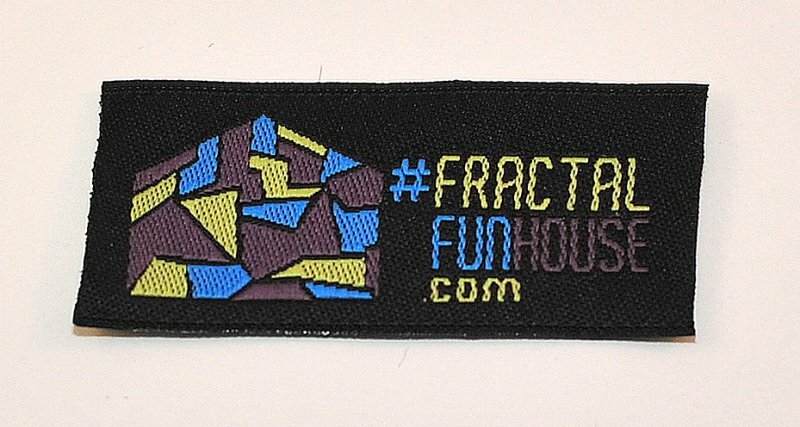 Day 51 – Spreading Sunshine with the Fractal Fun House! After reading this and seeing his label done through Sienna Pacific, you get a good feel for his fun product line. This is a 4-color, woven damask label that is a great example of a fairly intricate design. The detail that can be captured with woven labels is tremendous; this is a standard damask, but we also offer high-definition damask labels. Another common misconception is the more colors, the more scratchy a label can feel in the clothing. 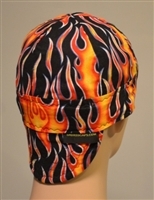 Proof shows right here in this entire line of spandex products for men and women, that the woven damask at four colors is still comfortable to wear. Whatever your medium of fabric is, from spandex to wool, canvas to leather. The versatility of the woven damask label is capable of completing your project with comfort and style. Both Diane and Paige are competitive athletes know what it means to need quality sportswear for competing. They offer a wide variety of high quality, affordable products that perform and provide that edge of attitude through style. BeFAST has outfitted Nordic Ski and Cross Country running teams across the U.S. and sells products worldwide. This is an end-fold woven damask label that is sewn on the inside of these headbands, neckbands and hats. 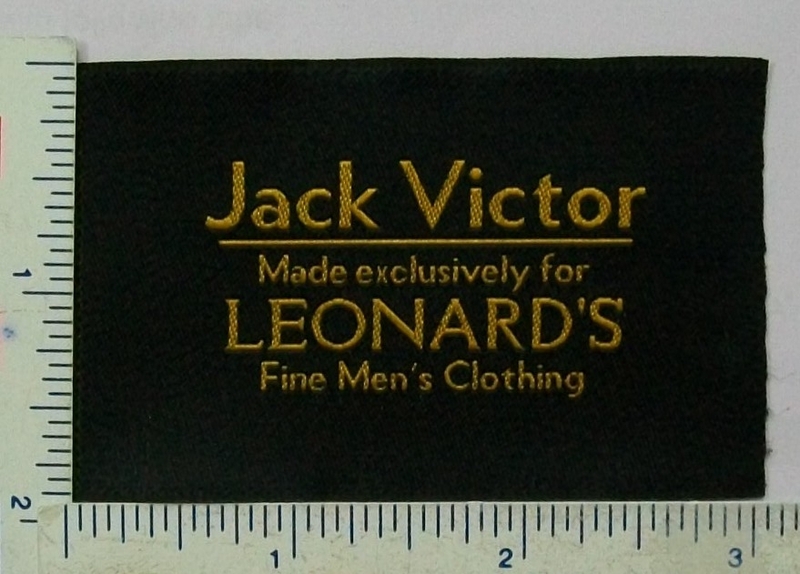 The label is actually 1/2″ longer than it appears to provide the space needed to sew on the label from both sides. This is another great example of the comfort provided with damask labels!